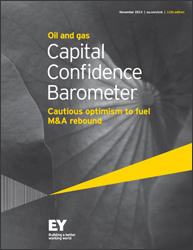 The oil and gas M&A market is awash with ‘cautious optimism’ according to EY’s new Capital Confidence Barometer. The Barometer, EY’s 11th, paints a picture of an increasingly stable global economy which, although still recovering and relatively modest in scale, will lead to an increase in oil & gas M&A activity. “The issues surrounding the oil & gas M&A landscape are primarily uncertainty and volatility,” said Andy Brogan, global oil & gas transaction Leader at EY. “While the broader economy is increasingly seen as stable, growth is anemic, and has notably slowed oil demand growth. EY’s survey found that the number of oil & gas executives who believe that the global economy is more secure has doubled in the last 12 months. Executives are now positioning themselves to respond to a market which, although still sluggish, is once again beginning to stir. Key findings in the Capital Confidence Barometer include: (i) 94 percent (of oil & gas executives) expect the global economy to improve or at least be stable over the next 12 months; (ii) 53 percent are expecting the oil and gas deal market to improve over the next 12 months; (iii) 68 percent expect that their deal pipeline will increase over the next 12 months, almost double compared to expectations six months ago; and (iv) 53 percent see increased geopolitical instability as the greatest economic risk over the next 12 months, up sharply from six months ago. Sluggish and uncertain the market may be, but for many oil & gas companies, dealmaking prospects are firmly on an upward trajectory.